One of those stories that you're not sure what to about. Do you emulate the Rov and Rebbetzin and prepare nosh for the little monsters, or do you just take it as a lesson in kiddush hashem bichlal, just to be sweet and nice and polite to nit-Yidden? I wonder if Rav Pam's children do the same today. I think I may have done the same thing when I lived in a mostly non-Jewish building in Crown Heights. Maybe not prepare bags of popcorn beforehand, but I may have given some nosh to the kids if they rang my doorbell. I'll have to jog my memory a bit. "For what it’s worth, I learned in Yeshiva Chofetz Chaim in Queens, NY. It was common knowledge that the Rosh HaYeshiva - Rav Henoch Leibowitz, zt”l - and his Rebbitzen, a”h, would hand out candy to the local non-Jewish trick or treaters who came to their door (back in Forest Hills there were many non-Jewish neighbors) Many Yeshiva bochrim lived in their basement over the years and will readily testify to this. This is part and parcel of being a good neighbor. BTW, Rav Pam & Rav Henoch were “classmates” as young men & learned under Rav Henoch’s father - Rav Dovid Leibowitz, zt”l - for several years. 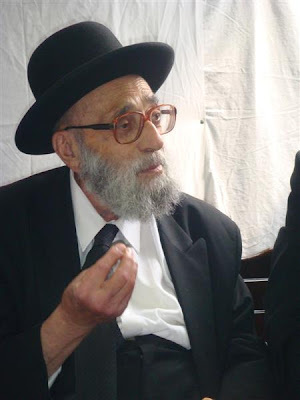 Rav Dovid was a very close friend and older Chavrusah of Rav Yaakov Kaminetzky’s back in Slabodka. Word is that Rav Yaakov, zt”l, would also hand out candys to the local non-Jewish trick or treaters. There’s an easy to follow trail to their attitudes and behaviors." You hear that, you people in Boro Park and Williamsburg??!! The point isn't chas vesholom to laugh at Rav Pam. I'm just allergic to such goody-goody stories, as well as how this gadol said good-morning to the janitor in his building and that gadol would tip his postman come Kratzmech. I blame my chassidishe upbringing for that. We focused more on the length of your peyos and the type of hat you were going to wear. Lubavitchers are also guilty of too many of those kinds of stories, just so that you know and see that I'm being sincere here. Have a Happy One! I've often heard about the differences between different groups of frumme yidden and how they related and reacted certain events. Also, how that mindset may have contributed to the two groups having different outcomes when it came to Yiddishkeit and continuity. [I realize that may have sounded like English but was totally unintelligible, so I'll explain.] Let's use this picture as an example, shall we? Look at the Hadras Ponim on the elderly Gaon. This was a short while before he passed away, so maybe I'm defeating my own point here... But nevertheless, let's give it the "old college try" anyway. Malka - the photo tells us - had left to America thirty years before and was only now coming for a visit. I would assume that in America she assimilated like most other Jews did. I would further assume that she had "veremlach in ihr kepeleh" long before she left to America, which is why she left in the first place. Yet what do we see here? A father's love to his child, u'bifrat l'eys ziknosoi. In Ungarin/Marmuresh things were different. Such a daughter might have been shunned forever, no matter if they hadn't seen her for 130 years. M'vult tzeyn mool gezesen shiveh. לא יזכר ולא יפקד. The kids and grandkids would never know from such an aunt or uncle that they had. I guess the point was two-fold: 1) to defend G-d's honor. 2) Not to let that child influence the others. G-d wants us to be good and to hate those that aren't, including our own children. No preferential treatment. I guess it was easier to distance a child in those parts; I'm not sure why. Maybe it was because of the constant vigilance, they always were making sure their children behaved - which left no time for loving them. Looking at it in such simplistic terms would have you believe that those who made no excuses for their own children and shunned them just they like any stranger's kid (!) were on G-d's side and stood up for his honor. But how can we realistically say that about Yidden who had mesiras nefesh for Torah and Mitzvos all their lives and for generations prior to that? The Hungarians will always tell you how their way has been tried and true and time-tested. How even after the War, when the Poylishe and Di Litvishe zennen gegangen in di eygene hoor, how they never deviated from how it was in Der Alter Heim. I grant them that, at least from what I've seen. But how can a father be angry with a child, with his own flesh and blood? On the other hand: How can a father sit back and watch his child go off LeTarbus Ro'oh, r'l. 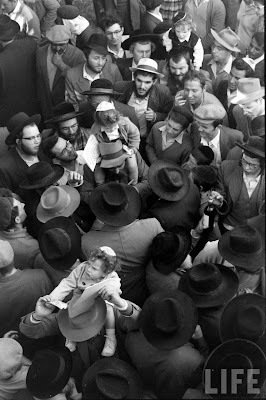 We've come along since the 20s and 30s, mind you, and many of those who would've sent the child tzu alle di shvartz yohr realize that to lose a child and subsequent generations forever is not an alternative. But in the old days people lived in the now - they had neither the time nor the wherewithall to look that far ahead ahead. After all, a shtikkel broyt for tomorrow they didn't have either. It was every day for itself. If you think that this is a case of the teritz being better than the kashe, you may be right. I was sent a picture by a Lutziner eynikel and fell in love with it. So we're staying on track here; we're trying to solve the yeshiva OTD (both On and Off the derech) crisis once and for all, so maybe it would be good to start with loving our kids, no matter what - yet not accepting anything and everything they do. 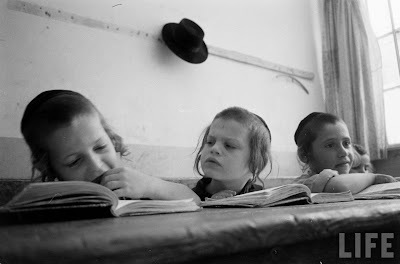 And if learning difficulties are the hand that G-d dealt you then there are places and people that can help him or her. Take it from Rav Don-Yichye, not from me. It's the only way. So now, all of a sudden we can't get enough of Rabbi Aron Krauss of Williamsburg. I had never heard of him before, and I'd bet that most of you hadn't either. But today he's very famous. He said what nobody dared say in public, and since it was after the z'man Motzoei Shabbos already he was recorded too. No he doesn't know what to do himself anymore. Now he needs to refuse interviews. Vos Iz Neias, that bastion of Torah values, found themselves a gold mine with this speech. Hundreds of (mostly idiotic) comments they got on the story. As if they care about kids on the street... Even COLlive got into the act and brought the story. After all, we all care about kids on the street, now don't we? But there are those that do care, and they try and save those kids that are stigmatized for not being "MiTzeeYoonim." There are Yeshivos that take them in, and not for $25,000 a year either. But it'll take some time until parents realize that it's more important to worry about the bochur's current life than to worry about what kind of shiddukh he'll make 5 years from now. That sometimes a few years in a program that caters to you will be more beneficial than subjecting the child to boredom, ridicule and turture. I've heard from several krante mekores that this Rabbi Kraus is a very special Yid, and that hundreds come to hear him every week, so I'm not doubting his sincerity (although one may have to wonder if he was burned by some מוסד once upon a time, and that's what causing him to speak out against his own people like that. IOW, it may have taken a major incident for him to get the courage to speak out like that and not worry about repercussions.) What I do doubt is what all this talk will accomplish. We sit here and applaud him for supposedly taking on the Yeshivos and challenging prospective donors not to fund such institutions, but most of us would kill to have our kids attend those mosdos... We'd be very proud come shiddukh time. And not funding them, especially if done so out of principle, doesn't exactly put you on their good list. We all hem and haw when asked about our kids if he's in a non-mainstream מוסד. So goes the world when you live for yenem and nisht for zich. You think about what's good for society and not for you and your children. And in the end you suffer anyway; your "square-peg" kids are forced into "round-hole" mosdos, and the result is a squashed child or children. So what did you accomplish exactly??? Rabbi Kraus doesn't just talk, he has a Yeshivah for such boys, but what about all of us who claim to care; what will WE do about the situation???!!! There's talk about a recent discovery of Apikorsus in our frum community. 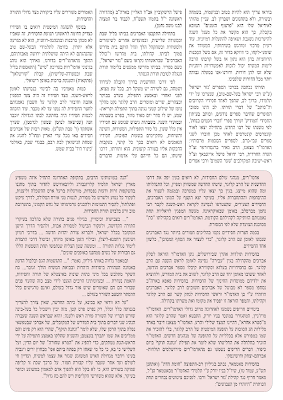 A group of bochurim from the Aleksander Yeshivah, which had recently become another satellite Satmar Yeshivah, were found to be "Apikorsim," r"l. Apparently, what set it all of was a yungerman who made it clear - one year after getting married - that he believed in nothing. No Torah min HaShomayim, no S'char VeOnesh. Nothing. To his shvigger, no less! That's right, he told his SHVIGGER he believed in nothing. Of course his vaybel said she was unwilling to continue life with a husband like that, and the divorce proceedings began soon after. That guy should be sent packing just because of a stupid move like that, not because of what he does and doesn't believe! In the aftermath they learned that he was the mentor of several such bachurim who were still in the above-named Yeshivah, and steps were taken to root out the heretics and banish them forever. Details are murky, and my Aleksander connection is not what it used to be, so I'll refrain from repeating the rumors that I've heard. Far be it from me to diminish the threat of Apikorsus in our community, but allow to be the skeptic here as well. אויף צו זיין אן אפיקורס דארף מען פריער וויסן אז ס'איז פאראן אן אייבערשטער, and I doubt that was the case here. I'd venture to say that this was nothing more than a group of guys that realized that just "bumming out" was not an option for them. They don't know how to have a good time, even if they could. You might say: "Tzig, why do you try and diminish the threat that blogs and books pose to our boys?" No, my friends, you misunderstand. There's no inherent threat; the fact that some boys stop believing is not because of a blog, or because some genius "opened their eyes," just like the fact that many of our kids go OTD is not because of an IPod or a billboard. It could be a lack of Yiras Shomayim is what causes one to go astray, if all is well. And often times Yiras Shomayim just doesn't happen with all kids. That's if there were no traumatic events during his youth, VeDal. Or it could be countless other things, like a lack of learning ability or a family dysfunction. Or it could be that we're taught to do things only because others are watching, not G-d. Yet, for some reason even most of the Rabbinic leadership seems to focus on the Ipods and the billboards. Can we blame most of these Rabbinic types? no. Not really, anyway. That's how they were raised and they think highly of themselves, so if it worked for them why tamper with a good thing, eh? But 2010 is not 1965, just like 1965 wasn't 1925. And we also cannot force this one model onto all segments of frum society, not until we force all frum Jews to be one homogenous group. MO is not Lubavitch, Lubavitch is not Yeshivish, Yeshivish is not Ger, Ger is not Vizhnitz or Belz, and they're not Satmar. Neither is Satmar Toldos Ahron or Avrum Yitzchok. We cannot write articles in Mishpacha and decide that the advice fits all shapes or sizes. each group has different reasons why so many fallen aveck. Oy! Boy, have I digressed. But have I really? Isn't that what happened to the boys from Aleksander? Does not all deviation from the path of the righteous have its roots in the same unhappiness? That's what I was told all my life. Whatever. Now I'm rambling again. 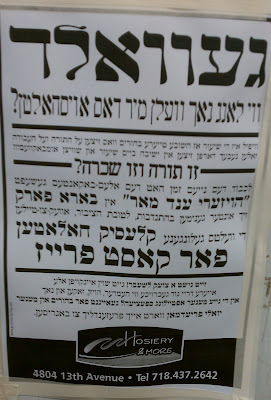 But of course this will turn into a finger-pointing session, and somehow Lubavitch will be blamed here again... So to sum it up: I would tell Aleksander Yeshivah to address the root of the problem rather than cutting off a few branches. There's a new star in town, and he shines a bit too bright for some people. 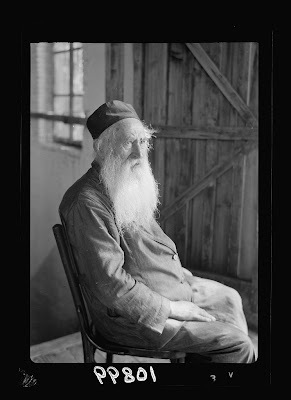 His name is Reb Avrohom Tzvi Kluger. He's the head of the Nezer Yisroel chaburah in Ramat Beit Shemesh. He fuses Chabad and Breslov and comes up with a very unique brand of Chassidus, one that is very attractive to hundreds of yungeleit. Most of those yungeleit are members of other groups, such as Belz, Toldos, Vizhnitz, Sanz(-Klausenberg), and so on. Most of those Rebbes are quite unhappy about this phenomenon, namely that he's siphoning off yungeleit from them. This hasn't really been expressed until recently, when some 150 yungeleit traveled with him to Uman for Rosh Hashonoh, some of them without complete wife consent. There are conflicting reports as to what happened next, but most reports agree on the fact that several yungeleit and their families were unceremoniously sent flying. Their families means that the little ones were chucked from the mosdos as well. 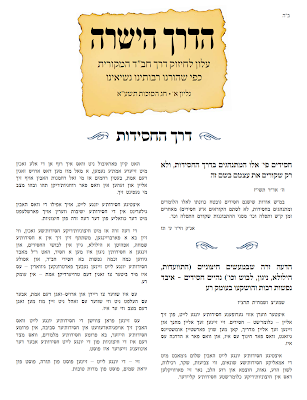 This has brought the chaburah to the forefront, and a major discussion of what happens there and whether or not they should be put miChutz L'Tchum is going on all over the web. I must tell you I'm surprised at the reaction, even though I understand what makes them uneasy. If there's one thing Rebbes don't like it's losing members. They may not go around and proselytize, but they want the numbers to go up, at least natural growth. Losing families is never a good thing. Chabad was always - at least in America - an easy target, maybe since there was never a worry that one day they'll have to meshadech with them, since the Rebbe had no kids... OK, scratch that thought. But Chabad was distant, you didn't feel guilty about attacking them at Shalisheedes Toyreh. But to call out a group and bash them for over an hour during an Ushpizin tish, which is what the Sanzer Rebbe from Natanya did, is downright peculiar. Why bring attention to a group that is seemingly no different than you are? They look just like you, which means that yungerman has no problem being seen there. There's nothing inherent that would keep him from going and seeing what's so terrible there. Which means that you're basically shooting yourself in the foot here. I apologize for the Shmais logo. I went to the website and could not find the picture. Back in '57 things were different. Lubavitchers still used Gemorohs, just like the rest of the world, or at least they put them in front of them when they posed for pictures. After all, Rabbi Kremer was a Peylisher who needed to raise money from fremde mentshen, and he couldn't show them the truth, that they learned Tanya and put tefillin on goyim all day, after which they'd get drunk! Berel Mochkin even forgot to remove the Tanya from his table! They had to lay low in the new country, lest someone expose their devious plan and blow the whistle. 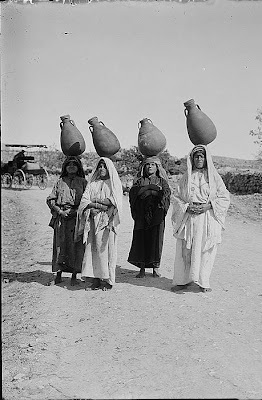 They also still lived in the same neighborhood as the rest of the frumme oylem, sooo. Somehow the kid in the front, Wertzberger, his father nebach thought that his son would learn something at Ol' Lubab High. Naive Hungarian, that man. Didn't they warn him about those no-good bums? But we need to admit that they did have a certain cheyn, don't you think? Those grey hats and suits with the beards... It's a shame what became of many of these same bocherim. 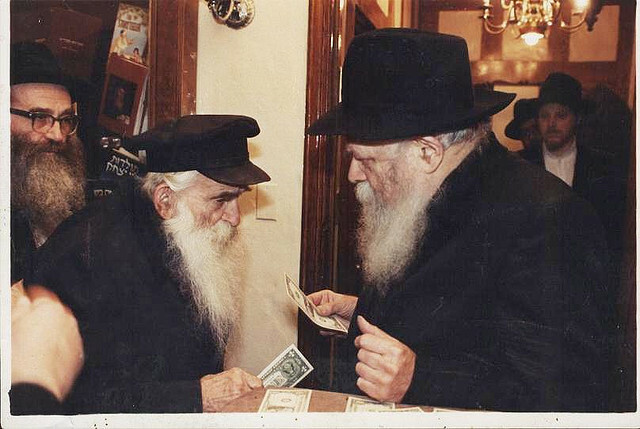 Shluchim who were mekarev hundreds of Yidden to Torah and Mitzvos. Chassidishe Baaleibatim who are kovea itim leTorah. Baalei Chesed and Baalei Tzedokoh. Rabbonim and Roshei Yeshiveh the world over. Seriously though, I'm amazed at how many of them zennen shayn nitoh, r"l,! and they were young 53 years ago! #7 is Pinye Korf, and number 26 is "? Heller" (not the Lubavitch one). #3 Harav Chaikin was better known by his second name: Chaim. #14 is Yisroel Mordechai's older brother, Dovid. #30 Zwebner's name was Chaim Elozor. Many of you have doubts about the veracity of the story I posted. Others say it was true but heavily embellished. 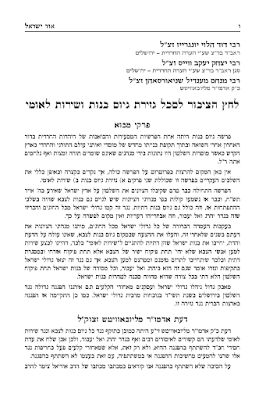 A third group says it doesn't matter if it's true or not, their opinion of the Rebbe will NOT change. I realize you think I'm think I'm some kind of "propagandist/PR man" for Lubavitch. Not that I know why; it's not like I talk about Lubavitch all day, nor do I attack Lubavitch's adversaries non-stop. But don't let the facts get in the way of your decisions. Despite that, the point of the story was not to make you Lubavitchers. I realize that won't happen, nor do I want it to happen. With some of you, joining Lubavitch would be a disaster for me, so I'd rather you stay put, wherever you are. All I wanted to do was to give you a small window into what we "see" in the Rebbe, which many of you fail to understand, whether willingly or unwwillingly. This story is a prime example of what we see. It's an example of the selflessness of the Rebbe and of his life's mission, no matter who the person was and no matter how nasty he was all his life to frum Jews, including Lubavitch. 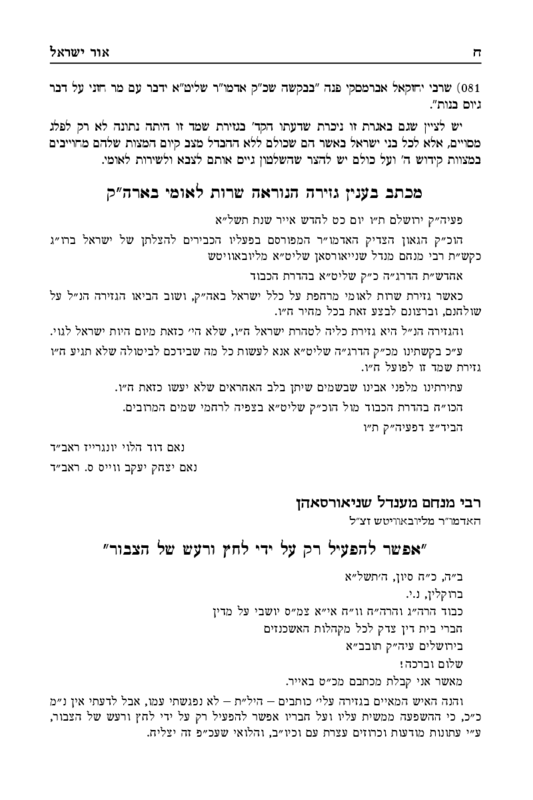 Oongeshtopte fressers like some of you here see "Shooneh Uperish'nikkes being honored," We see the Rebbe saving neshomos, and literally shlepping them out of the She'ol Tachtis. 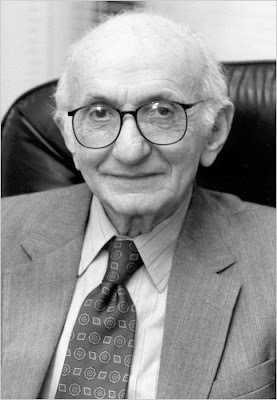 There were two ways to approach this man - Natan Yellin-Mor (Friedman) and his ideas. 1) ignore him or yell at him, which is what he expected to happen, presumably because that's what had happened to him in the past. 2) Realize that he's influential, and try and influence him so that we can influence others through him. The former is short-sighted; and despite the fact that we THINK that we're standing up for Kvod Shomayim, most of the time we're just defending our own honor. He disagrees with us, and with our way of life, so we dislike him and run him out of town. A wee bit of thought on the part of any man with half a brain will make you come to the conclusion that the latter is the correct way to deal with it. 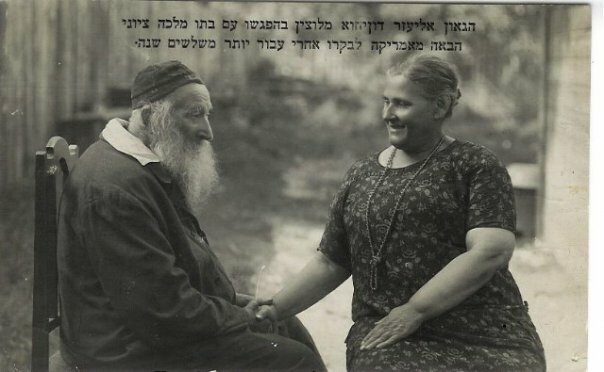 You might even say that the approach here was a two-pronged one; influence him and ratteve a Jewish soul, a soul (and eyes) that saw Reb Shimon and many of the greatest Torah minds of that era, (remember, he was from Grodno...) And try and bring many people back with him by realizing that he might share his new way of life with his readers, just as he would do when he loathed Torah and Yiddishkeit. The same way that people like Uri Zohar and Amnon Yitzhak and others are considered success stories; since they had a large following in their previous life and are influential ad haYom haZeh. Then there's how these stories help us stay close, even after 16 years. And like we all know, Hiskashrus and Dveykus in Tzaddikim is crucial. It helps keeps us on the "up and up." It makes us feel warm all over. It brings us close to Hashem. It teaches us and our kids about G-d's presence on this world, which is why we have Tzaddikim doing wonders in the first place - to help Yidden and to show them Hisgalus Elokus in some form on this world. And it makes us keeps us proud. Which is why Chassidim - and now non-Chassidim as well - tell Sippurei Tzaddikim whenever they congregate. There is one added bonus to my publicizing the story in front of thousands of people: That maybe some of you will stop foaming at the mouth when you see or hear Lubavitch. If I accomplish that in life iz shoyn vert. A note about the article itself: I'm working hard trying to locate the original, which is probably a fascinating piece of reading. Please sit tight. We're calling out all the stops. No stone is being left unturned. You get the drift. I can appreciate that they see the dangers of glasses with frames that lead the wearer of these frames down a terrible, slippery slope. I realize that they're trying to keep kids pure and innocent, but even I don't understand a word they're saying! Couldn't they attach photographs of forbidden frames, or would that lead to sin as well? How is a parent supposed to know what's forbidden? What's that? You say that they have takonos for hats and reklach and white shirts, so why not this? Well; I don't see the comparison. The fact is that most kids are pretty monotnous and homogenous when it comes to dress, at least in Mosdos like Tzaylem. They all realize what's accepted and what's not. The fact that some mothers might buy cute glasses for their kids is not gonna bring down Tzaylem, which is long past its peak. Printing an incoherent memo like this seems silly, at least to an outsider like me. These kids will be fine if we give them half a chance. Leave them alone and you'll see good things happen. Overreact and you'll see what happens, and you won't like what you see. "I'm no longer on this Earth, I am now in the shiva medurei gehennom". He then goes to describe the hellish fire that is gehenom, using a very vivid imagination, replete with a very colorful and scolding list of fires, one more colorful and frightening than the next. The reader is scared to death just from reading it. The cynic has totally lost it. He continues: "Rabbosai, I am definitely of a gehenom like the one described here. My whole life was one long fight against Hashem and his Torah. I never believed in the Afterlife, but if there is one then you know where I am now. The fires roar here. But suddenly a great light, the Or Shivas HaYomim, which corresponds to the Shiveh Medurei Gehenom, shines through the fires and reaches the lowly place where my soul finds itself. The great light smashes the mechitzeh shel barzel that seperated me from our father in heaven and conquers the depths of my essence, the pintele yid, and attempts to redeem my soul from the abyss. I believe that this great light will yet get me out of here one day. You may ask what that great light is... the light is the soul of the Manhig Yisroel UKedoshoy, The Lubavitcher Rebbe, shlit"a." "Allow me to share with you a story that happened with me." Here he goes on to tell the story of his מוצאי ר"ה encounter with the Rebbe. If I have one zechus in my life it is that meeting with the a manhig yisroel who had such faith , not just a faith in Hashem, but a faith in Hashem that was so strong that he believed in me as well. He believed in my Yahadus and in my power to do Tshuveh. because of his faith in me, a faith that I myself did not know I posessed. because of that faith, and despiet the fact that I did not know I had it in me, I now believe that light will one day shlep me out of this blutteh and bring me to the eternal light that is getlichkeit. A vareme grus fun gehenom." Those were Natan's final words. I'm no scholar, but if the Times gushes over him, and from the quotes they bring in the article, it doesn't look good. I didn't particularly like the last line in the Obit. America is what made him who he was. It may not be perfect, but judging from the fact that he escaped Russia in 1917 and came here - it must be alright. He was six when he came here, so it's not like he had a choice, I know. Then again; who am I to judge? On a separate, but related note I'd like to bring to your attention the absence of Reb Schneur, the resident scholar of Circus Tent. His input would be very helpful here. He was insulted on the blog and has made good on his promise never to return. I have tried contacting him, but to no avail. I ask that you join me in asking his forgiveness and inviting him back here. I am currently faced with a Chabad-related conundrum, which requires some on-the-ground inside information about the Chabad movement. Naturally, I turn to you and your readers, for some guidance. First, let me introduce myself: I like to consider myself an open-minded and objective fellow, who tries to view everybody and every situation objectively and fairly. Nevertheless, when it comes to Chabad, I find myself in an uncomfortable situation. Since I know almost nothing about them, I find my judgment influenced by the views of my friends and family: Chabadtzkers don’t learn, they want to make everyone Lubavitch, they all think the Rebbe is Moshiach, etc. Additionally, since I live in the tri-state area, my sole encounter with Lubavitchers is when I get accosted by some lost-looking souls, who loiter in the subways distributing Rebbe paraphernalia, awkwardly shaped phylacteries and shove a lemon in my face during the Harvest festival. Be that as it may, I am sure that somewhere out there, there are some normal Lubavitchers, and maybe they can provide some guidance. A friend of mine, is engaged to a girl whose father happens to be Lubavitch. The fianceé and her siblings happened to not be Lubavitch, although some of them are name Mussia, Mendy and Moshe. Until recently, the shver’s Lubavitchessness was a non-issue – until it came to the Chuppah arrangements. You see, the shver insists on reading a “Letter from the Rebbe” under the Chuppah. The chosson has no issue about this, but the problem is that his close mentor backed out from being misader kidushin. 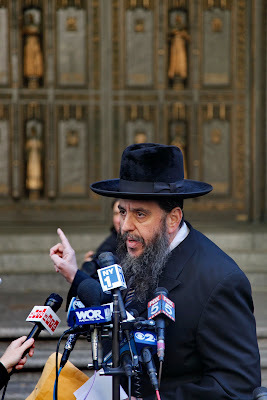 The Rabbi said something like “I am sure your father-in-law is a great guy, and he means nothing wrong by reading "The Letter," but Chabad has strange practices, practices which I don’t understand, and I therefore cannot be associated with such behavior.” [ HT says: Rabbis today are very worried about their image, you see. I would imagine the shver is not a man of means...] My friend desperately wants his Rabbi to “be mesader” and is desperate for a way of convincing him that the letter is "innocent." What should he tell him? 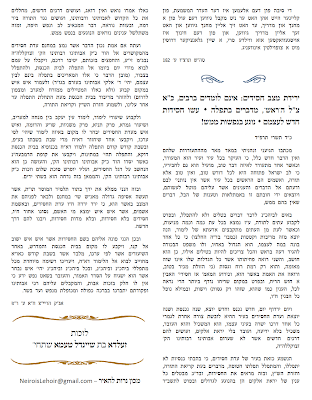 The way I see it: to the best of our knowledge, the reading of a Rebbe’s Letter by a wedding is unprecedented in Judaism. In other words, whatever rationalization the Lubavitchers give as to why they read the letter, the question is, how come it was never done till now. 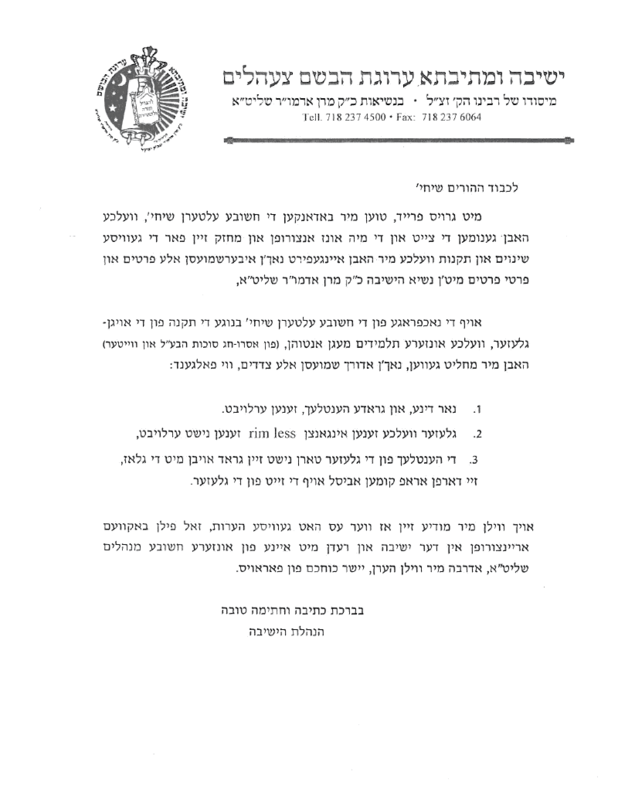 Therefore, we have grounds to suspect, that this letter is a symptom of Chabad’s recent glorification and emphasis as the Rebbe as a central figure. 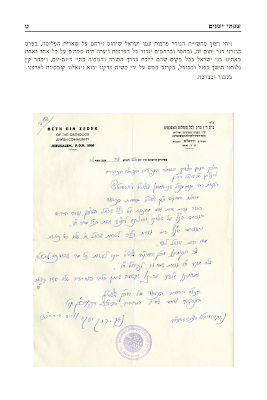 Meaning: reading the Rebbe’s letter is not just a nice and innocuous gesture, it is a means of connecting with him. They believe that by connecting with him, somehow that will bring positive energy. Obviously, if that is the case, we view it as a form of idolatry and will be avoided at all cost. [HT says: wow! 1+1 really is 5! 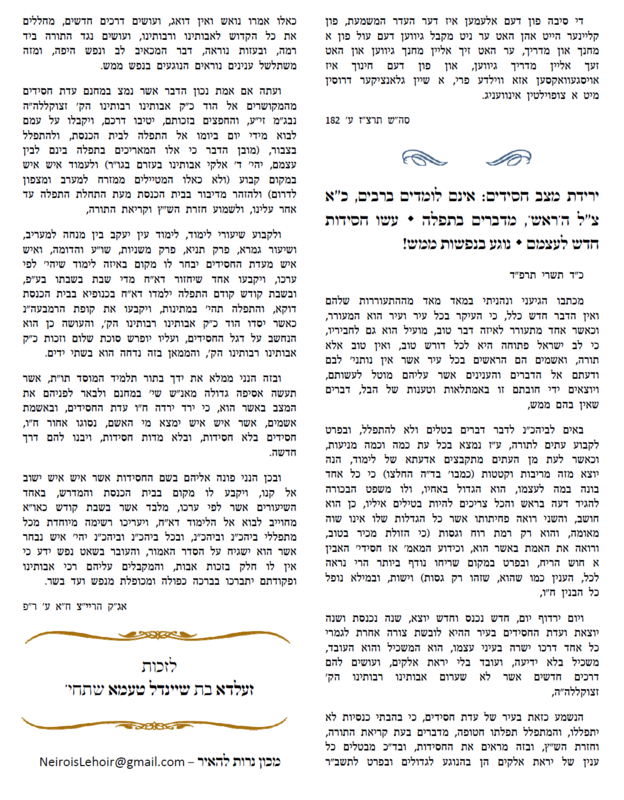 Reading a letter+ glorifying Rebbe = idolatry... Then they wonder why we don't like them!] ] My question to you is: can you explain to us what the significance of this letter is? 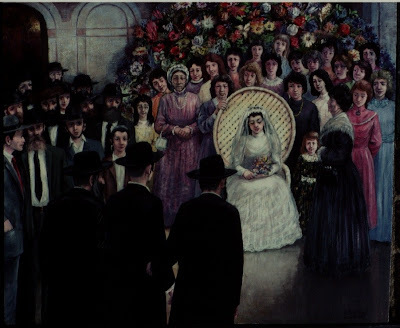 Can you articulate, in rational terms, what distinguishes Chabad from past generations of Chassidim, that didn’t (to the best of my knowledge) have a letter ceremony under the Chuppah? 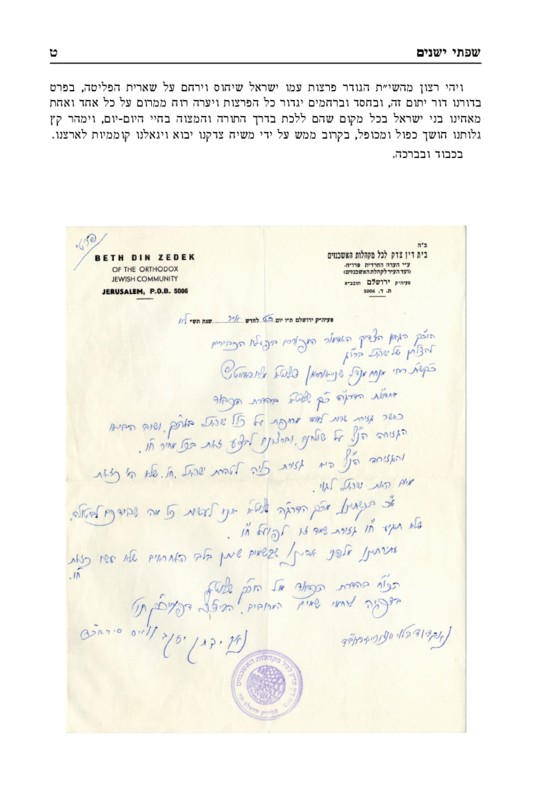 Can you convince us that this person, who probably had only minimal personal contact with the Rebbe (besides for sending faxes, which he does) feels such a connection to him? Yellin-Mor was dumbfounded. He said Goodbye to the Rebbe and the Rebbe responded in kind. Then he hears them calling him back. The Rebbe wants to see him again, they say. Gershon Jacobson was perplexed. Confused. Embarrassed, perhaps. Here he brings this "anti" reporter, ah Yelid Grodno who attacks Torah and Yiddishkeit every week, and the Rebbe only bentshes him, as if none of this happened. When Yellin-Mor comes back the Rebbe asks him "Now I have a question for you: What happens in your personal life as far as Torah and Mitzvos are concerned?" Rebbe: If you'd be 17 years old then thinking would be a great thing, but you're not. You've passed your 70th birthday. It's time to stop thinking and take action. How much longer will you delay doing something? Yellin-Mor, when remembering the story a while later, said that he was thinking to himself at the time; "what do I tell the Rebbe, that I despise his religion? that isn't very polite. Do I tell him that I keep Torah and Mitzvos? That'd be a lie, and I don't lie. So I told the Rebbe the following: It's like the story with RLY of Berditshev." Without batting an eyelash the Rebbe responded "That story was what he said about another Yid, you're saying it about yourself." Yellin-Mor quietly said goodbye and left. Upon arriving back to the Jacobson's home he told them how surprised he was that the Rebbe knew which story he was referring to. "There are countless stories of RLYB, but the Rebbe knew which one I meant. I was talking about the time that RYLB saw a Yid smoking on Yom Kipper and asked him if he knew it was YK today. The Yid answered affirmatively. "Maybe you don't realize that smoking is prohibited on YK?" Again, he said he knew. RL"Y lifted up his holy eyes to heaven and exclaimed: "RS"O, look at your children, they won't lie on YomKipper, even if they smoke B'Farhesya!" The Rebbe answered me that the story there is RLY being melamed zchus on another Yid, the Yid didn't say it on himself..." We had freedom of choice and we CAN make our own choices, but we also have the choice to change and begin to keep Torah and Mitzvos. There was no doubt that the encounter had shaken Yellin-Mor to the core, but that was not evident in his writings. Yet. Gershon knew what the Rebbe had accomplished when meeting with people, but even he began to think that maybe the Rebbe couldn't crack a nut like Natan. In 5740 the phone rang in GJ's office. It was NYM on the line. Sadly he was calling from the hospital. They had found "yenne machleh" and there was nothing they could do about it; he had only months to live. 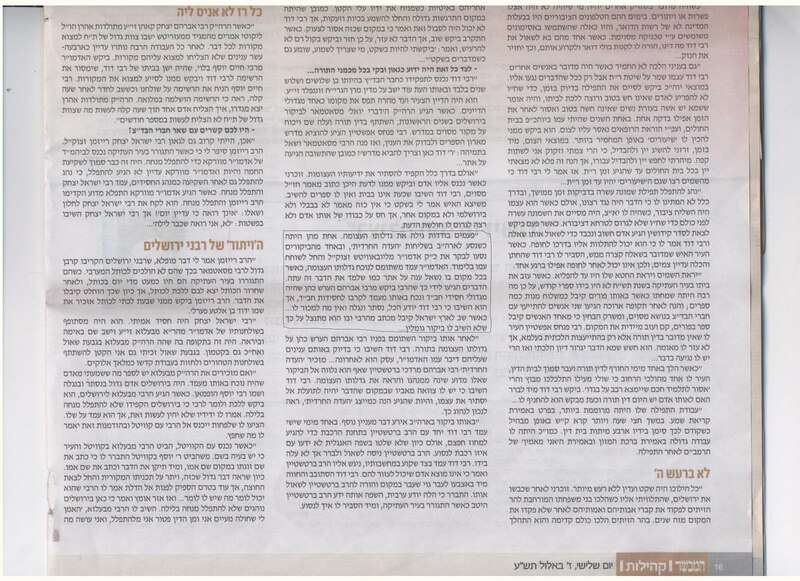 He called to "say goodbye and to thank Gershon for giving him the opportunity to publish his thoughts in his newspaper, despite it not being easy and us being on opposite sides of the spectrum." Natan wanted Gershon to come visit him at the Hospital, since he had something to give him. It was an envelope. He asked Gershon that he open it only after NYM's death. Gershon was quite surprised about this strange request and asked him about it. "You're not getting all mystical on me, now are you? You don't even believe in life after death!" But Natan was adamant and Gershon promised not to open it until his passing. "It was a pleasure working with you," Natan said. And with that they departed company, never to see each other again. 3rd and final part coming soon! I say that I enjoy Yehuda Levin's antics and you guys all bail out on me! I think he makes some very valid points here and takes the "Rabbi" sitting next to him to school. I understand that people are uncomfortable listening to a man with a beard and kapote broach the most uncomfortable of all subjects for a frum Yid, let alone a Rabbi. But doesn't SOMEBODY have to do what he's doing, speak out against the great injustice that the Reform and Conservative do in the name of Judaism?! Don't we need to tell the world that Judaism does NOT allow for such behavior? Is it all about the money and nothing else?! We've become to many what our brethren in Israel have long been. All you need to do is promise money and we'll vote for you, no matter if you'll sell us down the creek. (or is it "up the creek?") As long we have the money to move up or down the creek we're good to go. At least Levin tells people that Jews - some Jews, anyway - don't vote like that all the time. When there are issues on the table we vote our consciouses. Agree with him or not, he speaks the truth. But either way, let me hear ya! Don't let that post go uncommented on! UPDATE 10/18/10 1:45pm: I SEE NOW THAT A COMPUTER GLITCH IN OUR VERY SOPHISTICATED SYSTEM FAILED TO EMAIL COMMNENTS THAT WERE WAITING FOR MODERATION SINCE FRIDAY. I APOLOGIZE FOR ACCUSING MY READERS OF INDIFFERENCE AND THANK YOU FOR YOUR COMMENTS. There are all kinds of stories out there about the Rebbe. Some are nice, some are very nice and some are just, like "wow!" But even the "wow!" stories; how often does a story move you like never before? How often does it give you such a kitzel that it gives you no rest? How often does it tell you never to give up and never to lose hope? Here is one such story. You might say that there are two elements to this story, and that the point is not only what set the Rebbe apart, but also how a Jew must never lose hope. in 5737 Natan Yellin-Mor came to see Gershon on the second day of Rosh Hashonoh. (Please don't ask me if he drove or walked, or if he wore a yarmulke.) Gershon took the opportunity to explain to his guest about was what about to happen later that day at 770, when the Rebbe would wash before Shkiah, farbreng, speak divrei torah, bentsh, daven Maariv, make Havdoloh and distribute Kos Shel Brocheh. 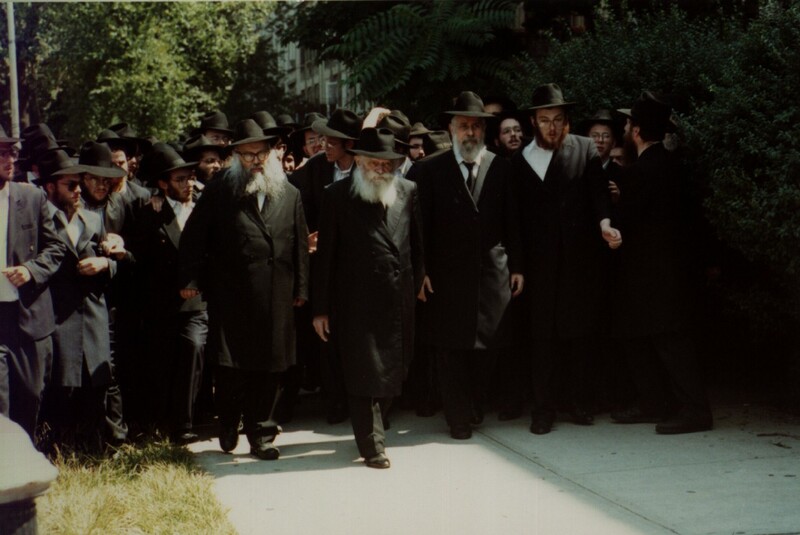 Gershon told him to accompany him to KSB and take the opportunity to meet the Rebbe. Natan thought that idea was preposterous; "Gershon, he said, the Rebbe knows what my opinions are, and his opinions are the complete opposite of mine, he'll throw me out of his shul if I come and see him!" "Nonsense, said Gershon, the Rebbe is a Gentleman and would never do that to you. Of course he has very specific opinions, but he speaks gently and will be very happy to meet you. You'll be happy you met him." The two arrive at KS"B; GJ gets wine and then introduces NY-M, telling the Rebbe "dos iz Natan Yellin-Mor." Yellin-Mor though that this was it, the Rebbe would throw him out shul, but to his surprise the Rebbe raised both his hands and exclaimed (I'm paraphrasing here) "Mr. Natan Yellin-Mor, far mir iz a greyser koved az ihr zent gekummen af ah bazuch tzu mir in shul. 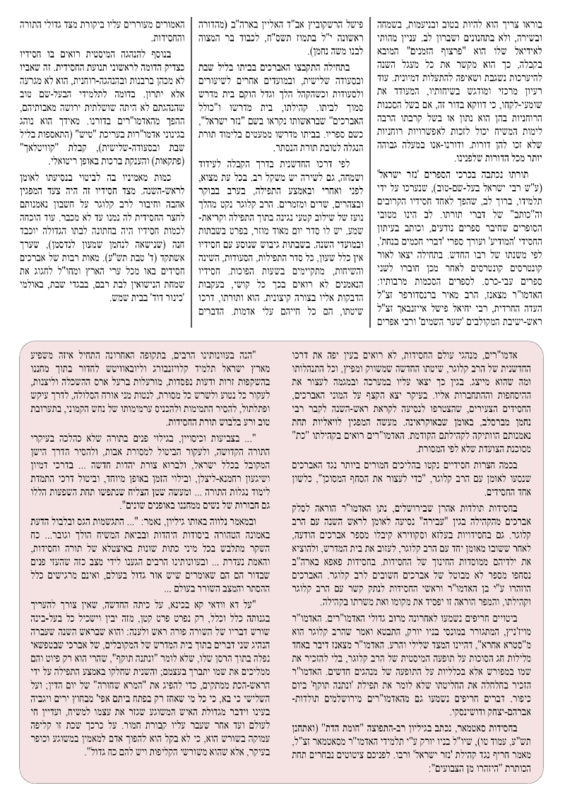 Ihr zent a gevaldig'e shrayber, ven ich bakum di tzeitung mitvoch ovent iz di ershte zach lein ich ayer artikel. Ich bet mechilleh fun der redakter, noch far zayn artikel. Ich bentsh aych az ihr zolt oysnutzen ayere talenten tzu lange gezunte yohren." NYM almost fainted right then and there. He stood there, unable to get a word out, until he stammered, "Ihr leint meine artiklen!?" 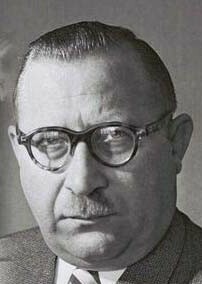 Ich farshtey nit, ihr zent maskim mit vos ich shrayb?! The Rebbe smiled and said, "If I would read only what I agree with I'd have very little to read... I read lots of things, including your articles." NYM was confused; "If you don't agree with what I write why do you bless me to continue writing,?!" he asked. "One day you'll yet write the truth," the Rebbe said, "for now continue writing. Every person gets talent from G-d that he needs to utilize to its fullest, and I'd like to see you utilize that talent in the future even more than you had done until now." Rav Chaim Kanievski says: 11 Sifrei Torah go up in flames in Vizhnitzer Shul in Bnei Beraq because they stopped using a generator on Shabbos in Vizhnitz. 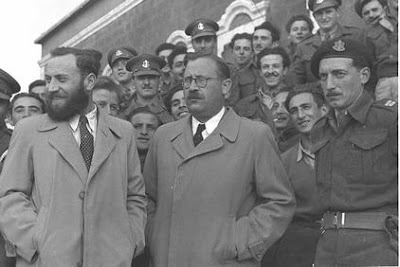 60 years ago the Imrei Chaim had agreed to the request of the CI to use a generator and now they had reneged on that agreement. They use the municipality's electricity. Now the koved of the CI is demanding retribution, and got it. "The CI has a din Sefer Toreh," said Reb Chaim, when they disrespected a Sefer Torah this is what happened. Many of Reb Chaim's mentshen deny this vehemently, they say RCK never said such a thing. 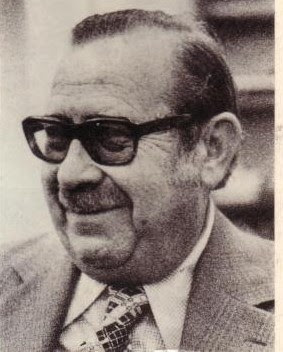 The Vizhnitzers say that the generator broke way back when the IC was still alive, pre-1972, and that Vizhnitz changed to electricity with his consent. 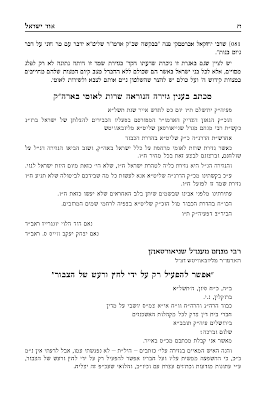 Reb Chaim was noticeably absent from the massive levaya that took place last week. 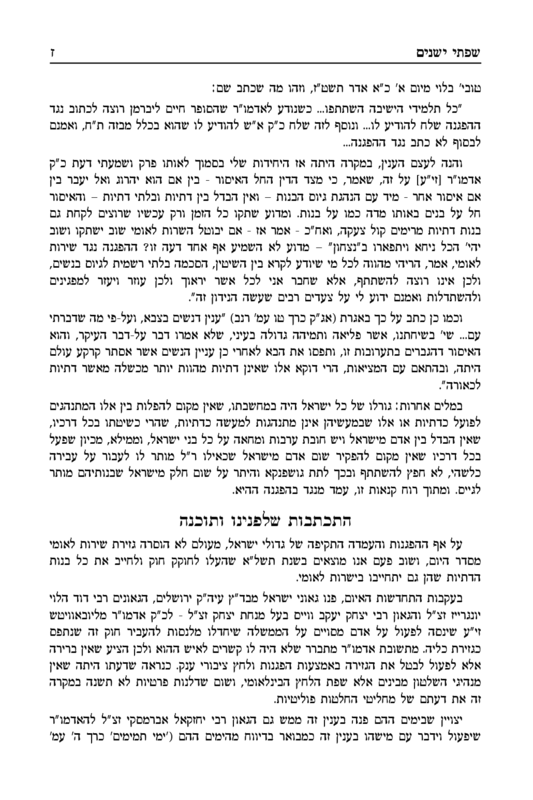 Last week Rav Wosner said it was because they were not nizhar in Koved Beis Haknesses. This was also the reason why the Holocaust didn't do as much damage amongst the Sefardic Jews, Rav Wosner continued, since they did have Koved Bais HaKnesses. Vizhnitzers are very confused now, not knowing whether they need to correct both problems or not. You guys wanna know why I don't comment on the recent Jeshurun hit piece? Very simple. I haven't seen it. I've heard lots of people talk about it, but I haven't seen it. And none of you knackers had the common decency to scan it and send it to me. You want me to lay out 20+ dollars just so that I can work even harder for you? Fuggedaboudit! It's also very hard to trust people like Prof. Havlin [author of the article] who very clearly has an agenda, i.e. fighting his grandfather's battle re: Yeshiva Toras Emes and Lubavitch. He won't rest until he makes Lubavitch look REALLY bad. Professors do that from time to time to time, they write books about people they dislike and claim to have no bias one way or the other... There's another recently-published book - also about Lubavitch - that makes the same claim! I heard they even got some computer program to match the writing styles of the Besh"t's letters there and elsewhere. Now that's something. All in the name of truth, of course. There! I've opened another Pandora's Box for y'all. Imagine yourself a young bachur in Williamsburg. Your heart is searching. Your soul aches for something other than Der Rebbe's eynikel's mitzvah tantz at 4am. You roam the neighborhoods looking for the truth. You crack every sefer that you can get your hands on, looking for the one that speaks to you. It takes a while, but you find it!!! Now it's several years later, 1am one late summer night. Your friends are walking down Lee Avenue with their shtreimel boxes in hand, returning from the latest wedding they really didn't want to attend. But they had to, it's their shvigger's second cousin's daughter and you had to waste another night this week. The second one. They missed half a day's work/kolel since they had to be there at the pre-Kabbolas Ponim pictures. They also HAD to wear the shtreimel; after all, which second cousin once removed doesn't?! You feel for them and for their lack in finding a derech. You find your way some years ago. Breslov. Oy, how Reb Nachman spoke to you and knew what was your heart and mind! And OY! how they - your family and friends - laughed at you [or were horrified] when they found out! But you persevered. In a way it was easier because on the outside you stayed the same, so there was no obvious change. Breslov is good in that way; you can stay the same and keep to your old dress, which takes some of the edge off. People can laugh at you and call you names, but that's about it. So for years you had a little shul to call your own in Willy. It wasn't much but it suited you just fine. There you could get away from all the name-calling and be with friends and like-minded people. There you could learn what you want with whom you want and when you want. In Williamsburg it's especially easy. Those that daven there are likely of the same background and mindset as you are. No need to put up with strange Na-Nach types like you would in Israel. 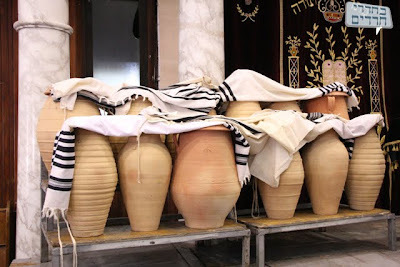 You meet them on your trip to Uman, but then you don't have to see them all year. It makes it easier. The one problem you had was the lack of space for "gein in feld." a.k.a. Hisbodedus. One of the main tenets of Breslovism. It's tough to do when you live in Willy. Where do you go, to the BQE? Fear not, Achi, now there's a place for you. 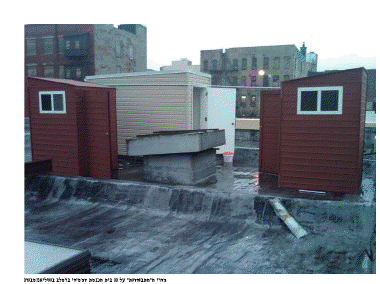 The new shtiebel on Rutledge Street has two Hisbodedus rooms on the roof. See picture above. It's the red ones, I believe. You head up to the roof, close the door and you talk to G-d, just not as loud as you would do in di feld. People might get afraid and upset and call the Shomrim... Good old-fashioned American know-how with some Hungarian thrown in more good measure. Kudos to the guy that came up with that idea. You're on the roof. Talking to G-d. Down on the street they're talking to themselves...Muttering, that is. The question never fails to come up, even among the friends of Lubavitch, and the kanoyim love to use that topic as fodder for attacking Lubavitch. "Where was the Rebbe and Lubavitch when we were battling decrees such as National Service for women?!" Somehow they don't see that building Yiddishkeit and caring about issues such as Giyus Banos go hand in hand. They'll agree that the Rebbe dedicated his life to building Yiddishkeit, but they'll question his commitment to issues like GB. IOW, the shayleh is really the other way around: how can one who claims to care about issues such as GB not worry about the disappearing Jew and how to bring him back to his father in heaven?! The good people at Kovetz Or Yisroel took it upon themselves to rectify the situation and to try and change the opinion of some of those people. I'd like to get this out there first, even before I've written alot about it, because every day that goes by is a shod af di tzeit. I don't always have the 7-8 dollars in my pocket to buy it when I see it, but the material in there is always second to none, month after month. And this has been going on for some years now. 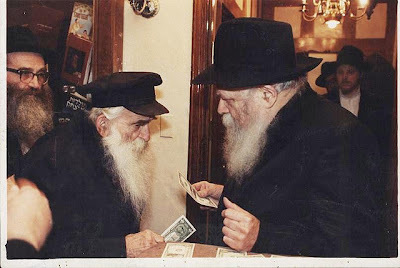 Reb Duvid Yungreis had a special connection with the Rebbe, as if evidenced from the Rebbe's Igros. Kedai to take a look at the letter and see for yourself. The Kanoyim love RDY, but they'll hem and haw when they'll hear about his shaychus. Or they'll find an excuse that it was "before ShaZar." (UPDATE 10/6/10 4:23pm) I know you guys aren't paying attention when I see that I had forgotten to post this page for TWO DAYS and nobody noticed!!!! Who didn't sign the letter? Who else was in the BaDatz at that time? 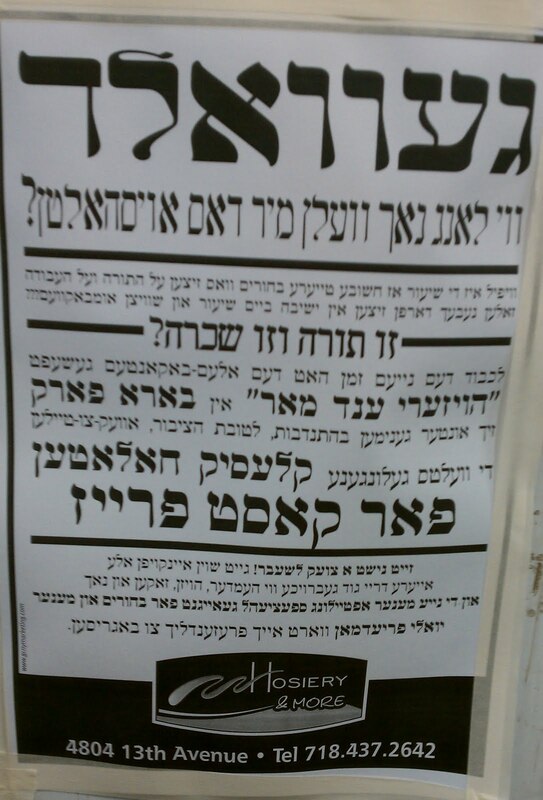 The Satmar Rov was GaAvD at the time and he didn't sign, but he wouldn't since he was in New York. I guess RMA Freund wouldn't either. Who else was in there, Rav Dushinsky II? 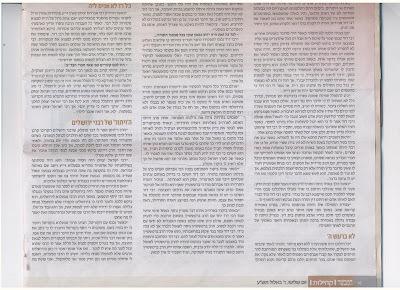 A recent article in HaMevaser mentions RDY's connection to the Rebbe. We're used to Judaism's groups having one face. Let me explain: In Di Litteh it's Reb Chaim and Rav Elyashiv. OK, make that two faces. In Chassidus it's Satmar, Belz, Vizhnitz etc. In Edut HaMizrach it's Rav Ovadiah, and maybe Rav Mordechai Eliyahu too. Somehow Rav Ovadia and Shas managed to make themselves THE face of Sefardi Religious Jewry. 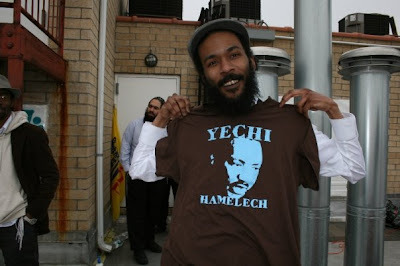 They give him credit for being machzir attara leYoshnah. 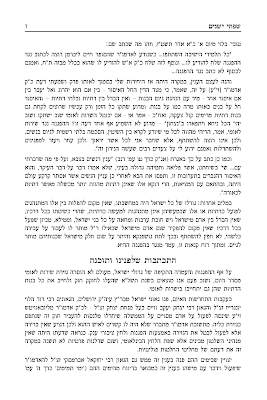 In a recent talk ROvY spoke about the fact that the Sefardim always learned in Ashkenazishe Yeshivos and that Porat Yosef was the only (serious, maybe) Yeshivah for Sefardic Bnei Torah. He made mention of this during the whole Immanuel saga last summer, and he thanked them for it. But now, he said, Shas has many Yeshivos and all Sefardim should learn there. 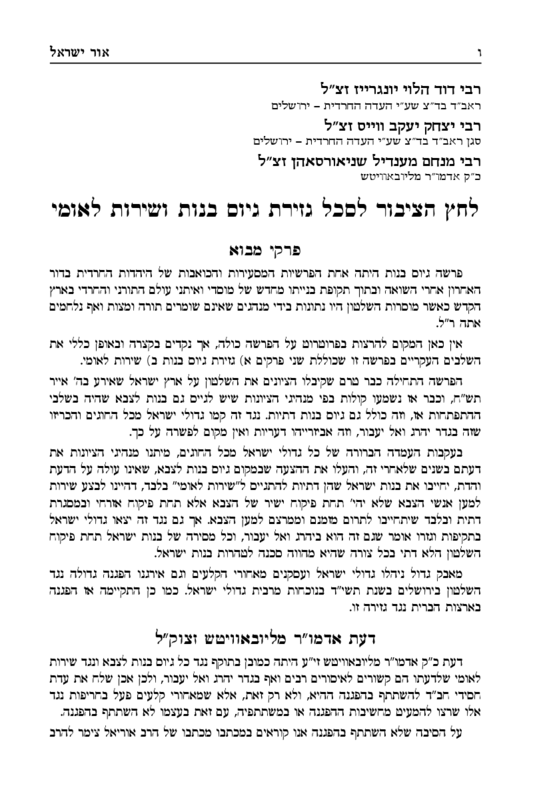 There's a not-so-well-known movement of "Bnei Torah-Sefardim" in Eretz Yisroel that identifies more with the Yeshivishe Oylem than with Shas. 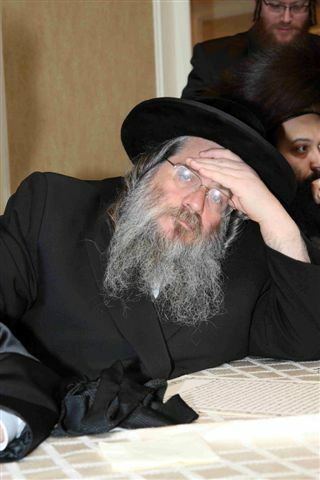 Some are major adversaries of Rav Ovadiah and never will forgive him for many reasons. Some are of the Kanoyim camp and dislike the fact that he turned Sefardi Jewry into a Political Party. Some don't like the fact that he made Sefardi Jewry into this large bloc that is forced to follow his Pesokim, which he says are based on the Pesokim of Maran HaBeit Yosef, and therefore all Sefardim are required to follow his rulings. That in turn made all other Rabbonim, including all Poskim from previous generations basically irrelevant, which made their followers rather unhappy. Rav Meullam and the Porat Yosef faction are now unknown to many because all they know is Rav Ovadia and Shas. Me not being of Sefardic extraction makes my opinion here basically irrelevant, but I would venture to say that there's a very strong difference in approach here between the two camps. You may not think that their intentions were pure and wholesome, but that fact is that Rav Ovadia's approach of building Yeshivos and Chadorim pulled the Sefardim up by the bootstraps and made them a proud segment of society, despite what the Ashkenazim may want and think. 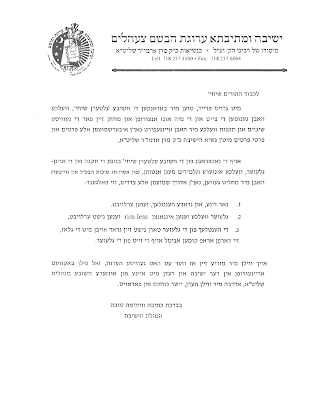 The Bnei Torah Sefardim movement is understandably not pleased with that development just like in Ashkenazic society the Talmidei Chachomim and Rabbonim would not be were they in a similar situation. You can compare it to the old pre-Chassidus society in Eastern Europe, where only the elite were expected and even allowed to learn. All others were expected to be Tehillim and Eyn Yankev Yidden. In the Sefardic lands you could count the Talmidei Chachomim in each city on one hand, and that "tradition" continued in Eretz Yisroel as well. Chas VeSholom, I'm not accusing Geonim like Rav Muellam and Rav BZ Aba-Shaul and Rav Yehuda Tzadkah of not caring about their people, they were just continuing the traditions of their communities for centuries. 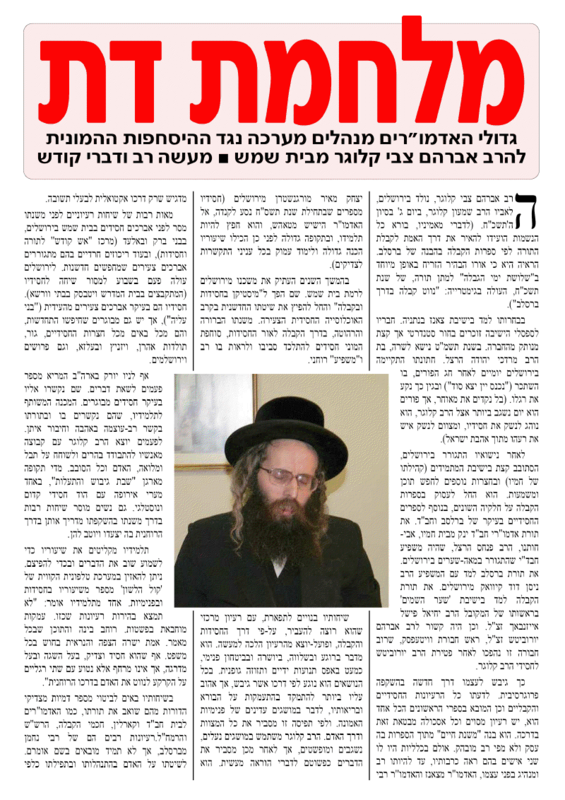 In a recent interview with Rav Yitzchak Yosef, son of, and author of VaYelaket Yosef, he spoke about his father and about the fact that he was the one that לחם לכבוד מרן שהוא המד"א בארץ ישראל. He mentioned how he made the Hamon Am change their minhogim despite that fact that this was what they did in Iraq, etc, AND DESPITE THAT FACT THAT THIS WAS THE RULING OF THE BEN ISH CHAI, ZT"L. The example he used was the issue of women making a Brochoh on Netilas Lulav, which according to the Mechaber is a Bracha LeVatalah. I was a bit taken aback by that. As if the BIC was not careful to pasken like the Beit Yosef, and only ROY was the one for whom the koved of the BY was important... This may be a Iraq vs. Morocco issue, or a Iraq vs. Egypt issue, depending on where the parties originate from. 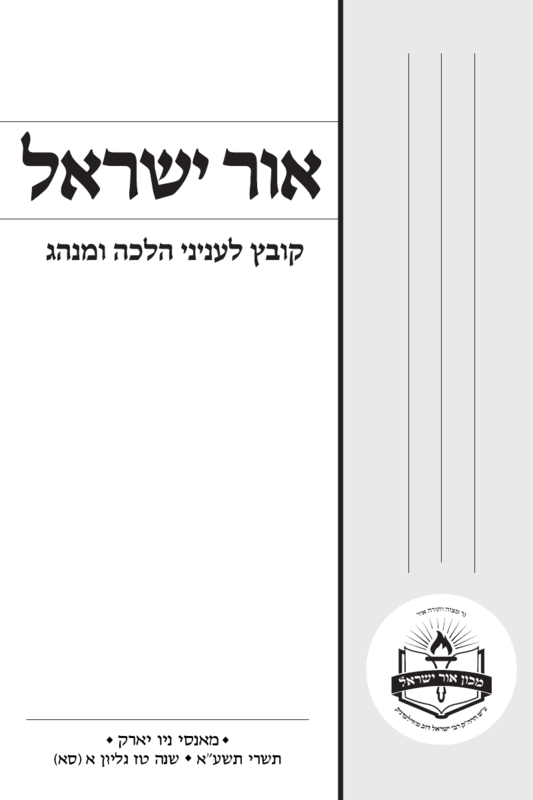 Which I guess is what irks some people too - the fact that the Shas people lumped all Sefardim/Bnei Edut HaMizrach into all big bloc that all are under the reign of Rav Ovadia, Sefardi Jewry's pride and joy and its biggest product in 500 years... That would be similar to comparing Litvaks to Yekkes and to Oberlanders, it just won't work. 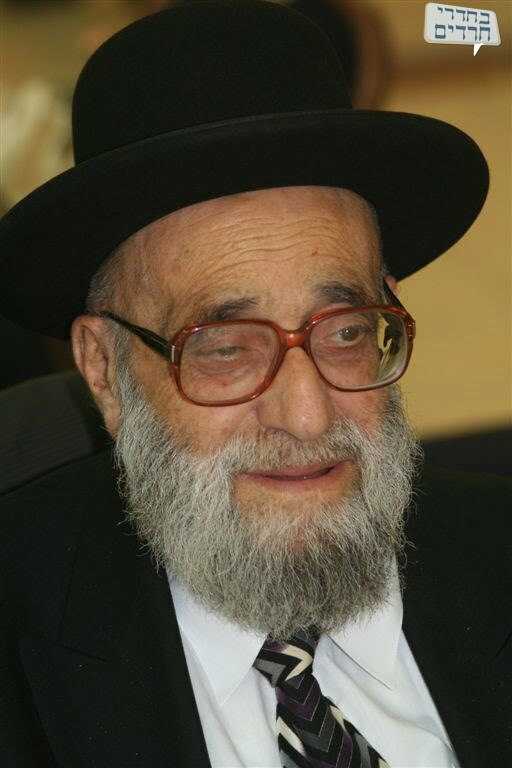 Rav Meullam passed away this Shabbos at the age of 90. He was a Mechutan with Rav BZ Aba Shaul - the latter's son being his son-in-law, and he was one of the last who learned in Porat Yosef in the Old City. Having said that Lubavitchers miss that. They'll tell you they don't need it because לא עזב את צאן מרעיתו and a myriad of other reasons, because מה זרעו בחיים אף הוא בחיים, because the Rebbe said Shvi'i means there will be no shmini. That's all good and well, but what about the "giluyim?" what will take its place 16 years down the line? How will our children know what it means to push during a farbrengen and to stand on the bleachers or on a human pyramid 20 feet high? So that is recreated several times a year in 770, maybe not intentionally so, but that's the result. Bachurim and Yungeleit and children can relive PART of what would happen during farbrengens - the "lots of people" part. Meshichisten take it one step further. They take a Lulav and Esrog and they "give it to the Rebbe." They then make lines to bentch on the "Rebbe's Lulav and Esrog. " After Havdoloh on Motzei YomTov they wait for Kos Shel Brochoh. You think they believe that the Rebbe is here giving out KSB? or that the Lulav and Esrog that somebody "prepared for him" is worth an hour wait in the cold rain? of course not. They just miss the old days and they're trying to recreate it. They want Giluyim.